Responsible people across America are stepping up to Solar energy for their homes and businesses. Taking control of your own energy security while helping our country meet ever rising energy demands is a positive action you can do. Your system will reduce the load on the grid, help insulate you from utility price increases, and give a real sense of pride by knowing that you are now a part of the solution. Studies such as those done for the American Appraisal Institute show that solar energy systems can be said to pay 'for themselves' the day they are installed on your home. The value of your property increases immediately. Houses with solar garner more visitors, stay on the market far less, and sell for a higher price. Uncapped Washington State Sales Tax Exemption. 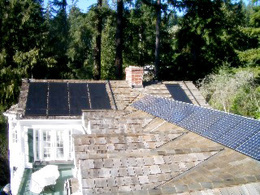 Net Metering: When you produce more than you use, the utility credits it back to your account! An increase in home value according to data from the American Appraisal Institute. Accelerated system depreciation over 5 years for businesses. 30% federal energy tax credit based on the installed system cost (capped at $2000 for residential customers). Because Solar Electric and Solar Hot Water systems are considered separate systems, you may “double dip” and claim both tax exemptions. For more information on solar incentives contact one of our solar specialists! Click here to find out more about the energy tax credit.